The civil government rewards and condones marital abandonment every time no-fault divorce proceedings forcibly deprive children of everyday access to a fit parent. Furthermore, for the party who did not break the marriage promises, divorce courts unjustly deprive him of his home and unjustly order him to pay support to an abandoning spouse. We want to have confidence that the Catholic Church would promote justice because justice is one of the four cardinal virtues. But instead, writers in the Diocese of Lincoln appear to be condoning injustice by their silence and distorted teaching about divorce. For Catholics, anyone in grave sin is supposed to refrain from receiving Communion and should confess and have a firm resolve to stop sinning. For Catholics, if a minister distributing Communion knows a person is in obstinate perseverance of grave manifest sin, the minister is supposed to deny Communion to the person. For Catholics, divorce (by default) is a grave offense against nature, immoral, and a fracturing of the marital contract to live together. (See Catechism 2383-2385). Only in delimited situations judged in a canon law case for separation of spouses might divorce be tolerated for a specific person who kept his marriage promises (emphasis might). 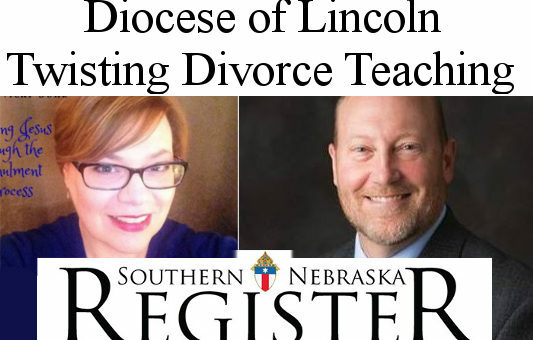 The Catholic Newspaper, “Southern Nebraska Register,” published in the Diocese of Lincoln Nebraska, distorts the Church’s teaching on divorce. On January 18, they promoted a program “‘Surviving Divorce: Hope and Healing for the Catholic Family’” which has 12-sessions, starting soon. This distorted teaching condones all marital abandonment by omitting the Church’s teaching that makes a stark distinction between the party in a divorce who keeps the marriage promises and the person who breaks them who is the cause of the break up. Catechism CCC 2386 – It can happen that one of the spouses is the innocent victim of a divorce decreed by civil law; this spouse therefore has not contravened the moral law. There is a considerable difference between a spouse who has sincerely tried to be faithful to the sacrament of marriage and is unjustly abandoned, and one who through his own grave fault destroys a canonically valid marriage (footnote canon law CIC c. 1151-1155). The diocesan newspaper says that their divorce program is facilitated by Vicky Sohl who helps lead meetings with Mike Timmins. Vicky had her marriage declared invalid, but it appears that Vicky had no support from the Church during divorce proceedings. Mike Timmins, the other facilitator, publicizes the divorce program as an accomplishment on his LinkedIn profile. Vicky Sohl has been a spokesperson about annulment on a Nebraska-based podcast. 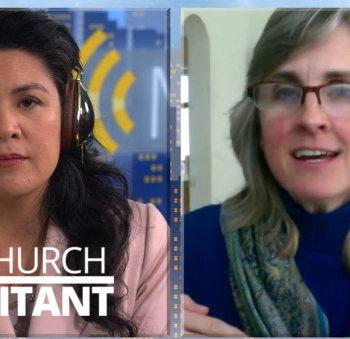 In her interview, she sounded unaware of the Church teaching on the grounds for separation of spouses and the difference between permanent and temporary grounds for separation. Vicky described her annulment process and sounded ignorant of the fact that it is illegal for the process to start with the petitioner submitting to the Tribunal judge answers to a long questionnaire, and she incorrectly described the grounds for annulment. Perhaps Vicky is only repeating what she was taught in the 12-part series sponsored by the Lincoln Diocese and she did not do any of her own independent research. Going back since before the Council of Trent in 1563, the Church has taught that the Church alone has competence to judge cases of separation of spouses. No one is supposed to decide on his own authority to file for civil divorce without a canonical investigation first. This means that the Church, using principles of divine and natural law should be judging whether one spouse has a legitimate reason to be separated from the other. Furthermore, the Church–not the civil government–has competence to decide the obligations of parties toward each other. For example, if diocese divorce program leader Mike Timmons was like other Dad-divorce-defendants, the civil court has no legitimate authority to forcibly separate the children from their Dad, or to coerce Dad to lose his children in an alleged parenting time agreement. Furthermore, if his marriage broke up due to his wife causing the marriage to be invalid because she had a grave lack of discretion of judgment, then he should not owe her alimony or spousal support because she was never his wife in both the civil forum and the ecclesiastic forum. She could have even owed him damages for fraudulently entering a marriage contract and keeping secret her psychic problems. The “grave lack of discretion of judgment” is the most common basis for annulment used by diocesan tribunals in the U.S. and this ground contains canon law legalese for mental incompetence on the wedding day. Nebraska civil statutes show that mental incompetence is a ground for voiding a marriage (Neb. Rev. Stat. §42-103). If Catholic diocesan leadership were assisting Mike at the time of his separation, the outcome could be more just than the outcome from no-fault divorce. When a Catholic newspaper and website teach readers that divorced people can receive Communion, the writers are misleading readers into thinking that the Church doesn’t care about keeping families together. The Church’s only interest in marriage appears to be whether a party attempts (on his own authority) to enter a second so-called marriage. If a Catholic is the cause of one’s divorce, the Catholic is supposed to confess and have a firm resolve to avoid the sin, that is, restore one’s intact home and reconcile. We encourage dioceses to implement the Catholic Code of Canon Law about separation of spouses and we encourage bride and groom to sign an agreement promising that they will uphold marital obligations defined in the Catholic Code of Canon Law. We believe that many disheartened spouses will choose to reconcile — if encouraged by canon law and deprived of rewards for abandonment dispersed by no-fault divorce judges. For those who actually have invalid marriages, we encourage the Church to decide the obligations of parties toward each other in accord with canon law and tell the state to back off, so that children and reliable spouses will be protected from the injustice and expense of no-fault divorce proceedings. The Church never relegated marriage decisions to the civil government, and in virtually all divorces, one or both spouses are in grave sin.